The global residential security market is anticipated to become USD 63.4 billion by 2024 and is expected to witness 8.1% CAGR during the forecast period (2018 – 2024). The growth of this market is attributed towards increasing demand for systems and components. Additionally, expanding awareness regarding innovative technology along with extensive growth of IOT and increasing utilization of these security systems at residence are the crucial factors pertaining towards the growth of the market. Moreover, increasing rates of crime and less number of security workforce is further driving the growth of the market across the globe. The residential security market, on the basis of product, is segmented into security cameras, smart locks, fire sprinklers & extinguishers, sensors and security alarms. Among all these product categories, security cameras have been generating largest revenue and is expected to witness a CAGR of 9.1% during the forecast period. The increasing market revenue of this segment is attributed towards increasing adoption of security cameras for generating secure and safe residential surroundings with the help of superior quality visual and audio surveillance. Moreover, there are several factors such as Wi-Fi competencies, night vision and motion detection fueling the demand for progressive security cameras in the residential security market. It has been observed that security cameras along with motion detectors provide notifications and alerts to its users wherever a suspicious event is witnessed by it. Furthermore, it also enables night vision that helps in recording videos and images in dim light scenarios and these cameras are extremely useful in reducing criminal acts occurring during the night time. These factors are thereby driving the growth of the global market. Based on solution, the residential security market is categorized into audio-visual surveillance, home integrated security, intercom system, access control & management, fire protection, and alert system. Among all these solutions, alert systems hold the largest share owing to their compatibility with different mobile devices and increasing awareness regarding residence security. Among the different resident type namely independent residence and apartment, the security solutions are in higher demand in apartments due to increasing trend of urbanization and increasing investment for smart cities across the globe. Diminishing cost of security cameras, extensive increase in IOT devices, increasing utilization of smart security devices and extensive demand for progressive residential protection plans are the major factors driving the growth of residential security market across the globe. Increasing technological upgradation has resulted in generating improved security devices and solutions at affordable prices. Moreover, technological upgradation in sprinklers and fire extinguishers is another factor driving the growth of the market as it is extensively being used as with technological progression instant fire extinguishers and automatic sprinklers have been establishes that provides enhanced applicability. These smart devices help the residents in tackling and controlling fire in less time. Furthermore, adoption of automated technologies such as analytics and IOT is generating ample opportunities for the residential security industry to grow connsiderably. Additionally, investments and funds provided by the state and federal government in developed economies for promoting technological upgradation in residential security is the major factor fuelling the growth of the market across the globe. Lack of accessibility and awareness regarding choosing of right solution, threat to privacy of the users and high cost of security solutions for residence are the major factors hindering the growth of the residential security market, globally. Globally, the residential security industry players are leveraging market growth through consistently advancing their offerings in accordance to the rapidly changing needs and demands of the customers. Some of the key players are entering into strategic alliances with several technological majors to convert their offerings and align them with security technologies that observe extensive demand such as mobile applications and wireless security. Geographically, North America the largest residential security market and is expected to generate revenue of USD 25.1 billion by 2024. The Asia-Pacific market is expected to witness fastest growth of 11.0% CAGR during the forecast period. 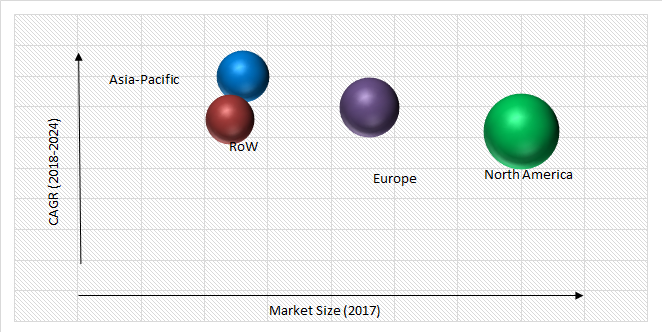 The rapid growth of this market in the region is attributed towards, progression in new technology, enhanced digitalization, and extensive adoption for connected technologies. Moreover, technological upgradation in construction activities that includes automation of security devices and increasing initiatives undertaken by the government authorities such as development of smart city projects are the major factors bolstering the growth of the residential security industry in the region. Some of the key players operating in the residential security industry are Bosch Security Systems Inc, Honeywell Security Group, Alarm.Com, Allegion PLC, Nortek Security & Control LLC, United Technologies Corporation, Ingersoll Rand, Control4 Corporation, and Godrej & Boyce Mfg. Co. Ltd.
Table 154 Snapshot – Godrej & Boyce Mfg. Co. Ltd.